Previous analysis updated – price traded higher as outlined, however, the expectation of a secondary high was wrong. On the plus side, this move to record highs has provided clarity going forward and the expectation of a significant decline remains unchanged. 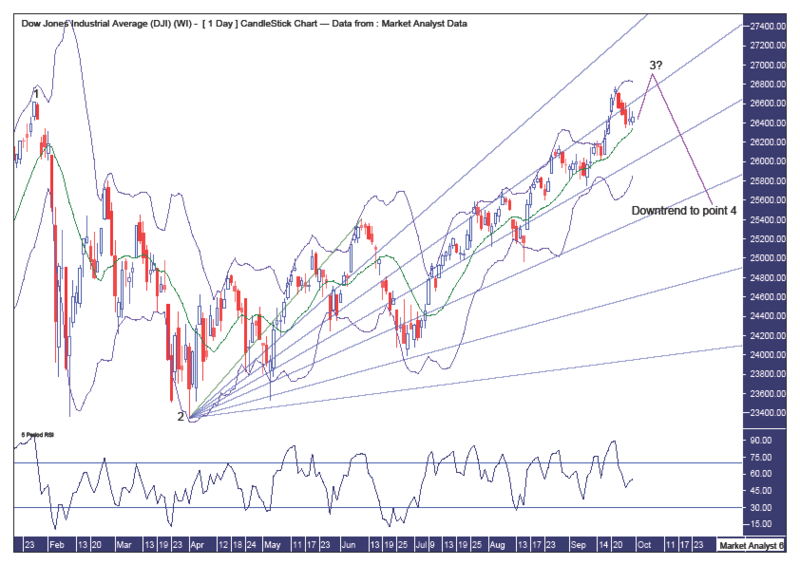 Pattern – in previous analysis I outlined the various broadening top and low formations. They are still in play although I have not included them in this chart. Instead, I wanted to focus on the new broadening top formation that this move to new highs has put in play. I am viewing this current high as a point 3 high with price to reverse back down shortly and head for a point 4 low. There is a new moon on the 9th October so that is some potential timing for a high, give or take a day. Bollinger Bands – price is back around support from the middle band and I am looking for one final fling to the upside that tops out around resistance from the upper band. Fibonacci – the 38.2% angle continues to provide good resistance and I favour price to have one final crack at this resistance which ultimately fails and sees price turn back down and begin a downtrend. RSI – one final high now would likely set up a bearish divergence. Pattern – we can see more clearly how I expect the 5 point broadening top to shape up. Bollinger Bands – price looks to be trying to get back to the upper band and this band should be strong resistance. So strong that I expect it to turn price back down. Fibonacci – the point 1 high was at resistance from the 23.6% angle and this current high should not get back to that angle now, in my opinion. The 50% angle looks like a price target for the point 4 low. Perhaps around the 22000 mark later next year?? We can do more work on this later. RSI – a bearish divergence will form here. Pattern – I showed this chart in analysis in June and the expectation is that price is currently tracing out its way to a point 5 high. So, given the analysis above, the final high of the bull market would be the point 5 high on two separate 5 point broadening tops. 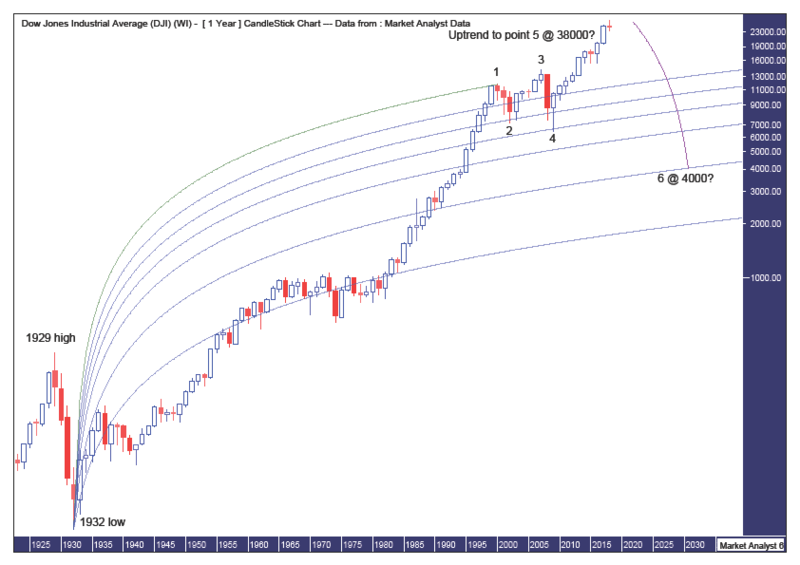 Fibonacci – (taken from June analysis) the question is how high will this bull trend trade? Given price is in blue sky territory I can only guess by taking an estimate of the subsequent bear market low using a Fibonacci Fan from the 1932 low to point 1 high set in 2000. I am looking for the bear market low to get back down to around the 76.4% angle which looks to be around the 4000 level. The 88.6% angle is around 2000 and that just seems too preposterous (as if the 4000 level doesn’t appear too!). After this bull market top is in, which I believe is still several years away, I think we will see a bear market similar to that which occurred after the 1929 top. In that case, price dropped around 90% into the 1932 low. If we are to see another 90% drop and assume the low will be around the 4000 level then that implies the final bull market high would be around the 38000 level. 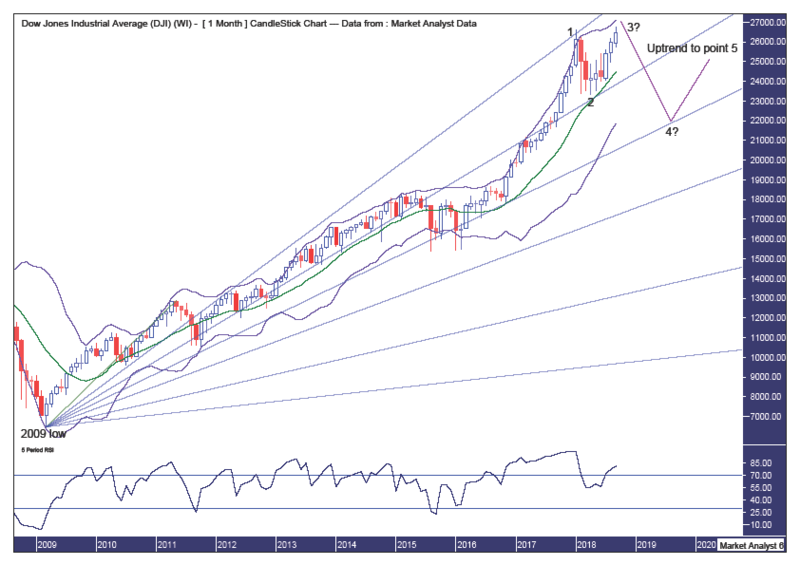 Summing up – I believe a top is imminent with a substantial decline to follow, after which the overall massive bull market will resume.